Right now (the time of this article) we're the only place you can buy these modules in small quantities and without an 18 to 22 week leadtime. We currently have a surplus of TLC5947DAP chips, purchased for a series of upcoming new products. Due to worldwide semiconductor shortages, this particular chip has been nearly impossible to buy for more than half a year. We finally saw a roll of 2,000 appear on Arrow's website, and it could only be sold as a complete reel. Since there was really no other way to get the quantity we needed, we decided to buy the whole reel and then make half of it available as a service to the general (electronics hobbyist) public. 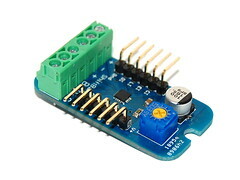 The TLC5947DAP (datasheet) is a powerful LED controller chip from Texas Instruments. It has 24 channels of individually-settable 12-bit PWM, each switching a current-controlled sink driver. The maximum current is set by a single external resistor for the whole chip. 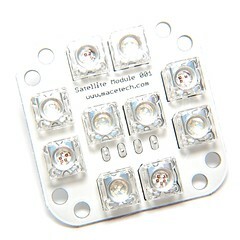 This makes the chip perfect for driving 24 LEDs with precise brightness control; ideal for controlling 8 RGB LEDs. 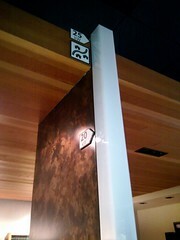 The current sinks eliminate the need for external resistors for each LED, with correct supply voltage and heatsinking. Submitted by Garrett on Wed, 02/03/2010 - 23:50. A quick heads up...for everyone who was disappointed by the huge traffic at SparkFun day, we're running a 10% discount in the macetech.com store to make you feel a little better. Just place an order and type in the coupon code FREEDAY and you'll get 10% off. The code is valid today and tomorrow only! Submitted by Garrett on Thu, 01/07/2010 - 13:33. Jason was talking to one of our distributors recently (Paul at Pololu.com). 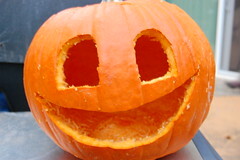 He mentioned that he wasn't going to be at home this year to try putting some ShiftBrites in pumpkins. That sounded like such a good idea, we decided to run with it! We had a bunch of high brightness LED arrays left over from a recent project, and decided to use those to replace the candles in some pumpkins. 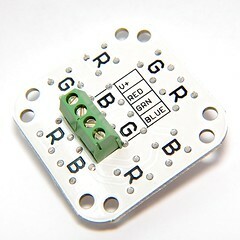 Each array has 10 five-chip 100mA LEDs: four red, three green, and three blue. 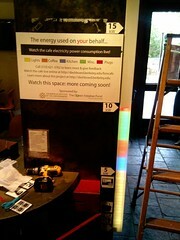 The extra red LED was added because they tend to be a little dimmer than the blue and green LEDs. Since the ShiftBar can't control more than 150mA per channel, the LEDs are arranged in series for a higher forward voltage, to approach 4.5W total. The light output is about the same as 15 ShiftBrites, with 5 extra ShiftBrites thrown in for the red channel. 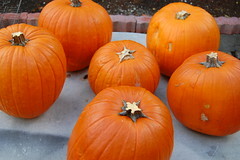 Naturally, we had to start with some pumpkins. I got eight of them from Safeway and set them up in the back yard. 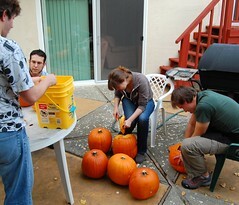 Our friends Ethan and Karly were coming over for a barbecue, so we added pumpkin carving to the list of activities. They were happy to help carve pumpkins...and also brought food and grilled it for us! The bison burgers were delicious. The pumpkin carving went as usual...disgusting pumpkin guts clinging to everything, etc. Submitted by Garrett on Sun, 10/18/2009 - 02:29. We've been selling the ChronoDot for a while over in the macetech store. It's a very accurate realtime clock module with integrated battery, based on the DS3231. It will maintain time within a minute per year, in varying temperatures. Instead of using an external source (GPS, WWVB, internet), it measures the temperature of the internal crystal and switches a bank of capacitors to pull the frequency back to 32KHz. Our original stock of 100 pieces was getting low, so we decided to order 200 more. However, there were some staff changes at our pcb manufacturer and assembler, and they didn't get the memo that we wanted the header pins soldered on the bottom of the device. I can sort of understand, since the silkscreen does appear on the top of the PCB...but they did make 100 correctly before. In any case, we got stuck with 200 less-than-ideal modules. You can still put them on a breadboard, but you can't see the handy signal names. Other than that, they work just the same as the original ChronoDot. We tried to think up a few possible solutions. Desoldering and resoldering the headers would be the obvious solution, but we didn't like the idea of subjecting all the parts to another process. Desoldering can be pretty damaging to a PCB and components. We tried to use them as snacks during one of our friend Karly's photoshoots, but even though the ChronoDOH is lead-free, model reviews were poor. Some thought it was "too crunchy" and others were concerned that it had "too many calories." So in the end, it looked like we were stuck with 200 of these unless we could unload them somehow. We decided to drastically cut the price, and give a chance for anyone willing to use a soldering iron to get a really good deal! The ChronoDOH is $7.99 instead of $14.99 for the original ChronoDot. It's not always going to be this cheap...we just want to get rid of these and have more ChronoDots built with the correct header configuration. And we'll sell those at the original price...we're running a business. So if you want to get a great deal on an extremely accurate RTC module, time is running out. They are selling steadily so far. Now, keep in mind that if you just want to buy a chip from Digikey, it costs $7.42 plus shipping unless you buy 25 or more, and only comes in surface mount. For a few cents more, the ChronoDOH gives you a PCB with the surface mount chip already soldered, and a lithium battery good for years of timekeeping. It'll work with DS1307 code, which already exists for pretty much any microcontroller out there. Basically, it's an incredible deal...if you have a project that involves timekeeping, get one now! Submitted by Garrett on Mon, 10/12/2009 - 00:51. Just in case this slipped past anyone, I'd like to introduce two new distributors of macetech products. Both have been great examples of self-starting electronics businesses in the post-bubble economy. Both owners are active in electronics development and applications, and sell their own designs in addition to products they believe are useful to their customers. Pololu now carries ShiftBrites. You can find them in the LEDs category. Pololu provides a wide range of useful products, especially strong in the area of sensors and motor control for robots. I've used their products before in a couple of serious applications (one was converting an electric car's rack and pinion steering to servo drive, for a drive-by-wire application). I appreciate the quality and support of their products and welcome them as a distributor. Pololu is located in Las Vegas. Spikenzie Labs now carries ShiftBrites, MegaBrites, and other related products. You can find them in the ShiftBrite category. Spikenzie Labs has a history of popping up with really creative projects, and some of them turn into new original products. They also have a knack for finding unique gadgets and making them available, like brightly colored breadboards and surface-mount adapters. Spikenzie Labs should be especially interesting to our Canadian customers; they're located in Montreal, so you can avoid the expense and delay of international shipping. Thanks again to these two great business, and we're looking forward to our future business with them! Submitted by Garrett on Mon, 07/13/2009 - 21:40. Here's a great video I found on YouTube. A 2009 graduate installed 64 RGB LEDs and 8 TLC5947 drivers along with an Arduino Mini, in a mortar board cap. I don't know the actual dimensions of a typical cap, but 8" per side seems about right. 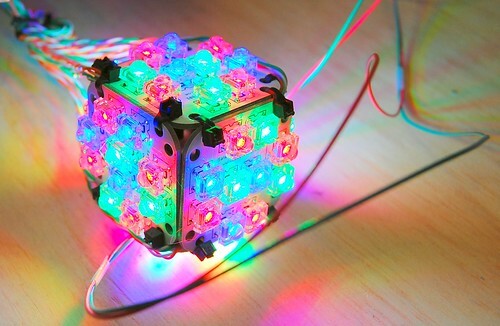 The project in this video could be easily duplicated by using OctoBrites, which are 4" modules containing 8 RGB LEDs spaced 1/2" apart. Cool stuff! Submitted by Garrett on Mon, 06/29/2009 - 16:14. ShiftBrites have been available for a while, and I haven't created an actual datasheet or hook-up diagram yet. I still need to do that, but this should at least provide enough information to understand what the ShiftBrite is doing, and how to control it. 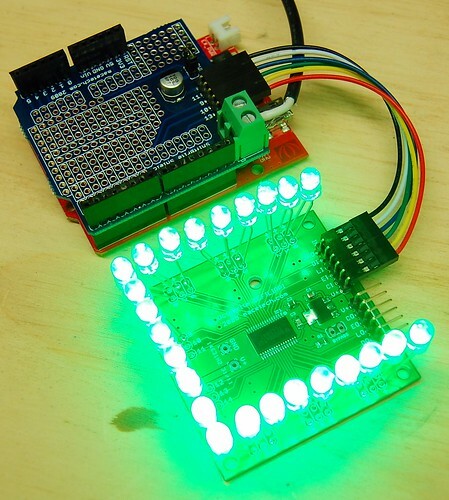 A ShiftBrite has an RGB LED and a small controller chip, the Allegro A6281. The A6281 provides 10-bit PWM and 7-bit current control for each of the red, green, and blue LEDs. The V+ and GND pins power both the LED and the control chip. ShiftBrites require up to 60mA per module when all LEDs are active. 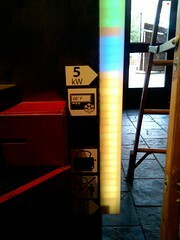 The supply voltage should be kept between 5.5 and 9 volts. I have had good results with 6V and 7.5V power supplies. The DI (Data In) pin carries the actual control information into the ShiftBrite. It is the input to an internal 32-bit shift register. Every time data is shifted into the controller, the binary value on the DI pin is placed in Bit 0 of the shift register, and the value in Bit 31 overflows out the DO (Data Out) pin to the next ShiftBrite in the chain. Data is shifted in using MSB (most significant bit first). Submitted by Garrett on Tue, 06/02/2009 - 00:43.